I hadn’t read Stephen King’s work since I was a teenager, but I was in the mood for something creepy for Halloween so I turned to the man who scared the bejesus out of me way back when with [book: Pet Sematary] and [book: Misery]. The Dead Zone wasn’t as scary and spine-tingling as I was hoping and expecting it to be (I thought the narrator would be talking to dead people or something, from the sound of the title), but it definitely hooked me from the start and kept me on edge waiting to find out what would happen next. 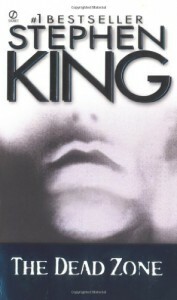 King isn’t really what most people would call a great writer of “literature” (like the stuff of the Great American Novel), but I think he has certainly had a big hand in getting more people to read books for pleasure than they would otherwise. His large body of work coupled with several successful movie and TV adaptations have garnered lots of exposure to people who normally have no interest in books and reading. So I think he’s been a very positive influence for the reading world in general. His books read much like a movie, are easy to follow, and are always (so far, in my experiences) quite gripping with complex and intertwining plot lines and extremely unique characters. I say all this because I’ve always felt a bit ashamed to say that I’m a Stephen King fan. Even though he blew me away with [book: The Green Mile] when I was 13 or so and it was my second favorite book at the time (after [book: Gone with the Wind] of course), I didn’t run around bragging about it. I felt like I should’ve been reading classic literature, the ones that have stood the test of time and are always on the lists of books to read before you die and school curriculums. Compared to all of those, King’s books were essentially the equivalent of the ever-present stacks of cheap romance paperbacks at the pharmacy. But now that I am older and a bit wiser I can read my King books with pride (or at least with ease) because I can keep thinking of all the new readers he’s attracting and that initial spark of love for books that he can inspire. Sorry for the spiel, but reading King after a decade or so of hiding away all his books on the very bottom corner of my most inconspicuous bookshelf got me feeling nostalgic and a bit ashamed for my past years of inadvertent book snobbery. So my apologies, Mr. King, I will be reading the rest of my secret stash of your books posthaste and looking forward to your next article in Entertainment Weekly.